On Wednesday night we flew from Mexico City to Lima, Peru. 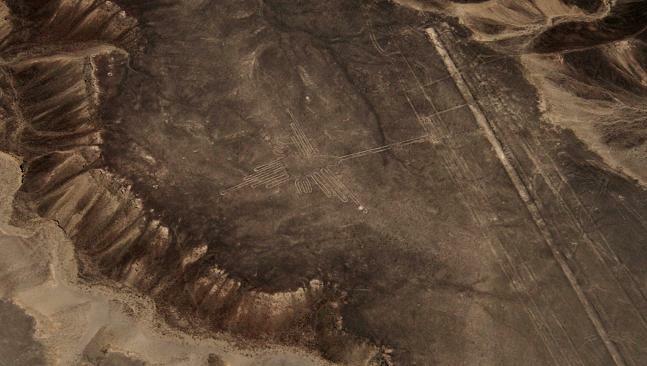 Unfortunately we didn’t get to see much of the city, but we headed south Friday afternoon to go and see the Nazca Lines. The Lines were another chapter of “the world’s greatest mysteries” books that Greg spent too much time reading as a kid, so the chance to go and see them was just too good to pass up. 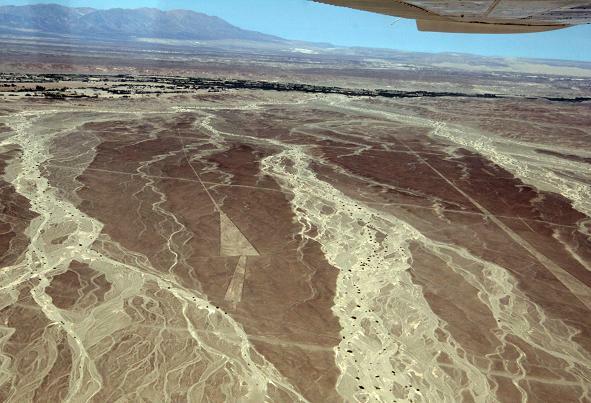 They are about 400km south of Lima down the Pacific coast on the famous Pan American highway – which runs of the top to the bottom of the continents. So the first thing you notice leaving Lima is that as soon as you leave the city, its just one big desert, a really really big desert – about 3000km stretching down the west of the continent, the desert is caused by the fact that the Andes hold all the rain on the Eastern side of the ranges, so the western side is as dry as a bone. 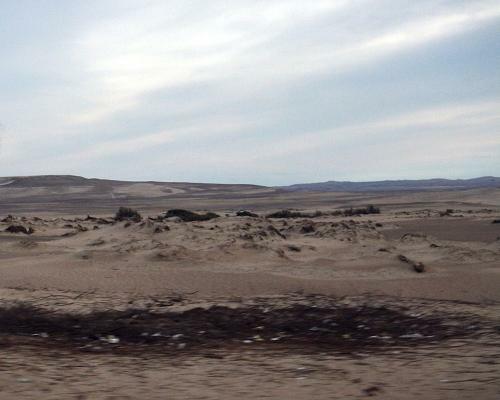 The desert just south of Lima. 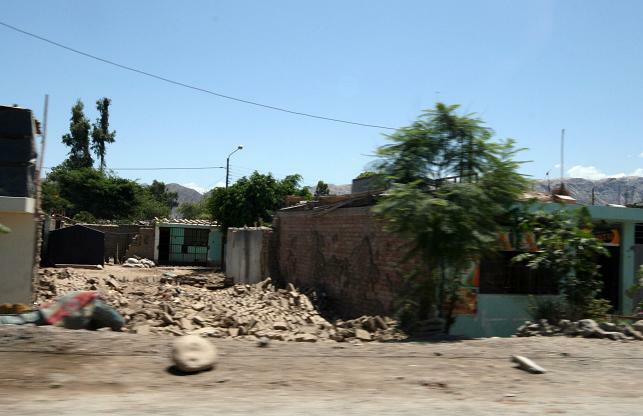 Our destination Friday night was the town of Ica, just 140km north of the actual Nazca lines, In August 2007 Ica was devastated by a 7.9 earthquake which destroyed one quarter of the towns buildings and killed over 400 people. So as we got closer to the town we saw more and more evidence of the destruction, all along the road and down the side streets the destroyed homes and businesses had been graded into neat piles that lined the sides of the road. The earthquake hit the poorest people the hardest, if you have money in Peru you build your house out of bricks and cement, if you can’t afford bricks and mortar you build your house out of Adobe (mud) bricks and hope like hell you’re not home when an earthquake strikes – which is pretty often around that area. So most of the houses that got destroyed belonged to the poorest of the poor, 100’s of houses have not yet been rebuilt (I suppose when you live hand to mouth, you have to balance a day off work to rebuild your house, against going hungry for the day because you didn’t work for that day) so the families are still living either in the ruins of their house, or in tents and plastic shelters donated by different aid agencies (you can tell the aid agency who donated the plastic as their advertising is plastered all over it). A pile of rubble which was once a family’s house. 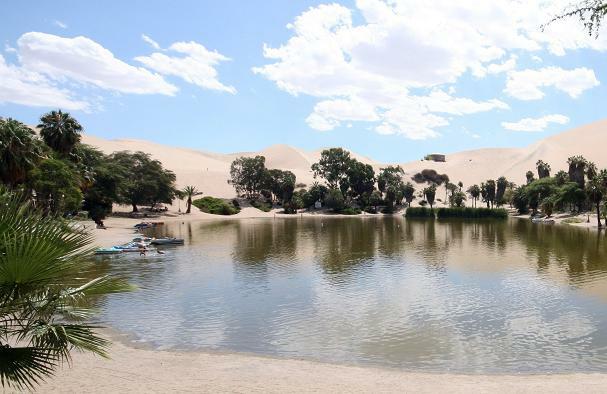 So in Ica we stayed at Hotel Austria, hosted by a lovely elderly couple – him an Austrian and her a Peruvian, they were awesome hosts, they quickly rearranged how we spent our time around Nazca, got us a cheaper deal on a day tour, driver and flight and were just magic hosts. If you stay in Ica I can thoroughly recommend their hotel, the place was full to the brim with Japanese Aid workers who are still working to get things back together again after the earthquake. We had a good chat with our hosts and our tour guide the next day about the earthquake and they were both adamant that the only way the town will recover fully is if the tourists come back… Since the earthquake the tourists have almost stopped coming into town, and the local economy is suffering as a result, so we felt that our holidaying was actually doing some good which was nice! So we woke up really early Saturday morning and were picked up by our tour guide for the day Angel – Angel runs a company called Angel Desert Tours and he was an absolute champ, he speaks more several languages and is a self taught tour guide, and a real enthusiast for life – and anything to do with the South of Peru – again we can heartily recommend him! 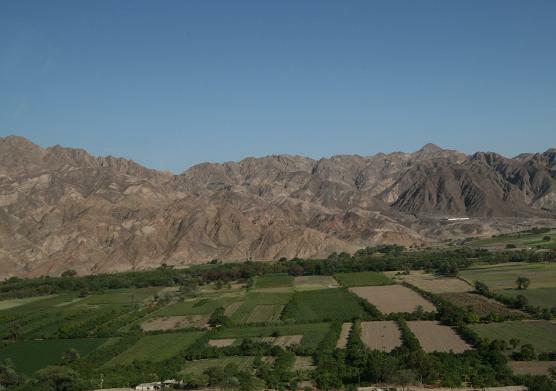 So he took us down to the town of Nazca, about one and half hours south of Ica, a great drive – a mix of deserts and lush green valleys. Along the way he filled us up with all the local history, and legends of the area including the stories of the Naca lines, for those of you who didn’t read “world’s greatest mysteries” as a kid, the Nazca lines are a set of massive drawings, geometric shapes and lines drawn into the desert floor from 200BC to 700AD. So of course to see them you need to be in the air, and thats where things got a bit “interesting”…. See we had been out the night before to one of the best and most expensive (read “a little touristy”) restaurants in Ica to sample the local delicacies – in Peru they love a dish called cerviche its made of raw seafood with lime and lemon juice, olive oil, chillis and coriander and another dish of marinated calamari in olive tapenade. At the time it was delicious, but at 3am it suddenly went downhill, Cath was hit with her first real case of South American food poisoning, and it wasn’t pretty, so of course the next morning the thing that Cath most wanted to do was to jump into a small airplane to have a look at drawings in the desert, but of course being the tough chick (sucker) she is, she still did it! 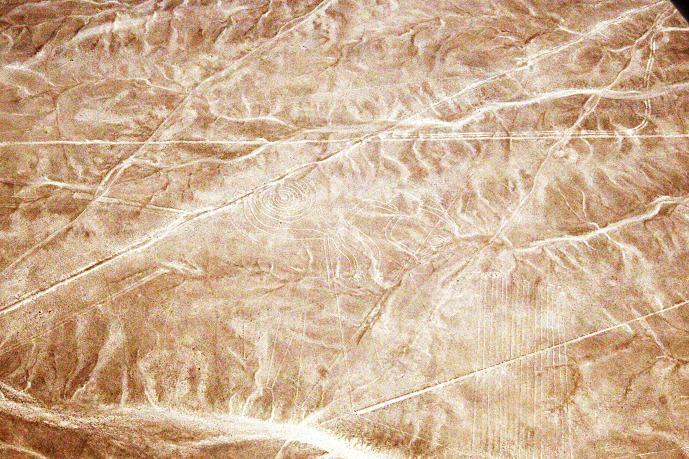 The lines cover an area of over 80 square kilometres, and no one is quite sure why they are there, but it seems that its either a massive astronomical calendar kinda like our zodiac, or as I prefer to think a set of landing instructions for visitors from out of space! After the flight our host told us that earlier in the week our plane had had to make an emergency landing on the Pan American highway – but he assured it that this was just proof of how good our pilot was! 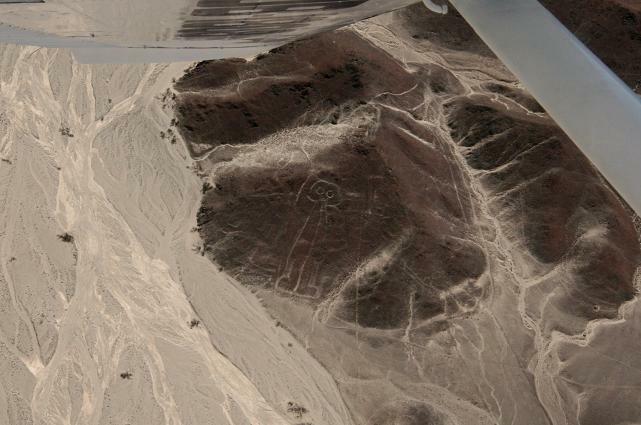 Interestingly most of the pilots that fly out of Nazca have made their money and bought their planes by flying special “cargo” from Colombia to the USA – but eventually they get sick of getting shot at and opt for the quiet life flying tourists over the desert! After that we headed back to Lima and caught an evening flight to Santiago, Chile, where we are now holed up, but more on the land of “tiny feet” next time!